Windows Media Center is dying a slow death. It’s not included with Windows 8, and it costs a hundred bucks to add it to the new OS. And now that the Xbox One has been revealed, Microsoft’s about-face when it comes to encouraging people to put PCs in their living rooms is less of a puzzle. Third-party developers, on the other hand, haven’t given up on the home-theater PC concept. Ceton’s InfiniTV 6 is a good example: This digital tuner lets you watch and/or record up to six digital cable TV channels simultaneously. Every PC on your network that’s running Windows Media Center can access live TV. Like Ceton’s earlier InfiniTV 4—a $199, four-tuner device that plugs into a PC’s USB port—its successor, the $299 InfiniTV 6, works with a digital cable TV subscription. It requires a multistream CableCard (an M-Card), which your cable company is required to provide (your cable company might also provide an SDV tuning adapter, which plugs into the InfiniTV 6's USB port). Unfortunately, there is no equivalent for satellite TV subscribers. The InfiniTV 6, however, takes a page from SiliconDust’s HDHomeRun Prime: It plugs into your router, so that every PC on your network that’s running Windows Media Center can access live TV. 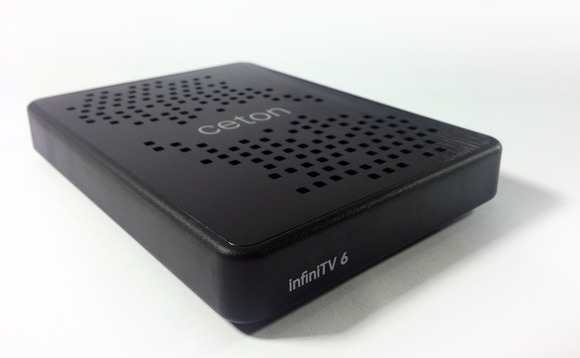 The Ceton InfiniTV 6 can replace the set-top box you rent from your cable company (but you will need to obtain a CableCard from your service provider). Let’s say you have a home-theater PC connected to the TV in your living room, a desktop in the den, and a couple of laptops scattered around the house: Each one can tap that generous pool of tuners. But keep in mind that your cable company’s largely uncompressed HD signals will eat up a lot of bandwidth. For a wireless network setup, you’ll need an 802.11ac router, the InfiniTV 6 will need a hard-wired ethernet cable connection (although you could try deploying an 802.11ac bridge nearby), and each PC would need to be outfitted with an 802.11ac adapter. I used wired connections in my testing, and did not test with an 802.11ac router. However you set up your network, those infrastructure requirements are the big wrinkle to using a network-based tuner instead of one that plugs right into a PC. Although the InfiniTV 6 has a mini-USB port at its rear, that port is intended for use with an SDV tuning adapter (if your cable company requires one). The only viable connectivity option here is ethernet. I tested the box with several Windows 7-based systems (Microsoft declined to provide me with a Windows 8 Media Center for testing) and a Comcast-supplied M-Card CableCard—the same one I used with my InfiniTV 4 USB, in fact. As with that unit, setup was fairly straightforward: Install the drivers, run through a few quick setup procedures, and presto! I had six HD tuners at my disposal. Everything worked smoothly from the start, and I never ran into a problem viewing or recording shows on any PC I tried. With six digital tuners, the InfiniTV 6 should meet the needs of the most TV-infatuated household. What’s more, although I rarely hit the tuner limit, Ceton’s software has a featured called “dynamic tuner assignment” that helps reduce conflicts when one PC tries to use a tuner that’s already in use elsewhere. Instead of giving up and returning an error message, the InfiniTV will look at all six of its tuners to see if one is available. That’s valuable for households with a lot of TV watchers. If you frequently find that you’re unable to record all your favorite shows because they overlap, the InfiniTV 6’s six tuners should easily alleviate that problem. And if you want to bring TV viewing and recording capabilities to multiple PCs in your home, this box has you covered there as well. But there’s no getting around the stumbling blocks that come in the form of the InfiniTV 6’s network infrastructure requirements and its dependence on Windows Media Center. Editor's note, 7/1/2013: This story was updated to correct two errors introduced during editing. Provided you have the right network infrastructure, Windows Media Center, and digital cable TV service, Ceton's InfiiniTV 6 is an excellent foundation for a whole-home TV-entertainment system. Six! Count ‘em, six digital tuners!